IP Result of anti-PGC1a (IP:20658-1-AP, 4ug; Detection:20658-1-AP 1:500) with mouse skeletal muscle tissue lysate 2200ug. PPARGC1A, also named as Peroxisome proliferator-activated receptor gamma coactivator 1-alpha, is a 798 amino acid protein, which Contains 1 RRM (RNA recognition motif) domain and localizes in the nucleus. PPARGC1A is transcriptional coactivator for steroid receptors and nuclear receptors. PPARGC1A can regulate key mitochondrial genes that contribute to the program of adaptive thermogenesis and plays an essential role in metabolic reprogramming in response to dietary availability through coordination of the expression of a wide array of genes involved in glucose and fatty acid metabolism. 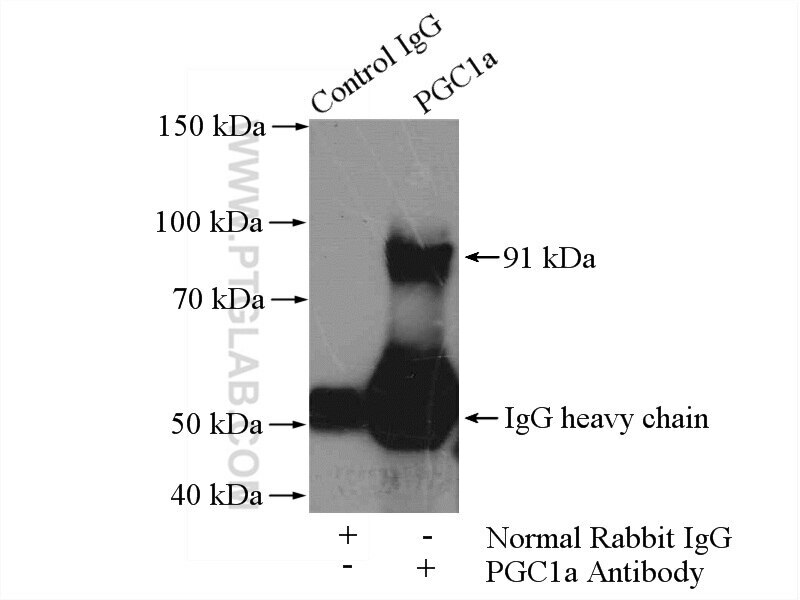 PPARGC1A exists various isoforms and range of molecular weight of isoforms are 30-50 kDa and 90-110 kDa. Activating the PGC-1α/TERT Pathway by Catalpol Ameliorates Atherosclerosis via Modulating ROS Production, DNA Damage, and Telomere Function: Implications on Mitochondria and Telomere Link. Salvianolic Acid B Improves Mitochondrial Function in 3T3-L1 Adipocytes Through a Pathway Involving PPARγ Coactivator-1α (PGC-1α). Restoring mitochondrial biogenesis with metformin attenuates β-GP-induced phenotypic transformation of VSMCs into an osteogenic phenotype via inhibition of PDK4/oxidative stress-mediated apoptosis. Modified Si-Ni-San Decoction Ameliorates Central Fatigue by Improving Mitochondrial Biogenesis in the Rat Hippocampus. SS-31 Provides Neuroprotection by Reversing Mitochondrial Dysfunction after Traumatic Brain Injury. Citrus Tangeretin Improves Skeletal Muscle Mitochondrial Biogenesis via Activating the AMPK-PGC1-α Pathway In Vitro and In Vivo: A Possible Mechanism for Its Beneficial Effect on Physical Performance.